Merry Christmas and Happy Dovetailing! 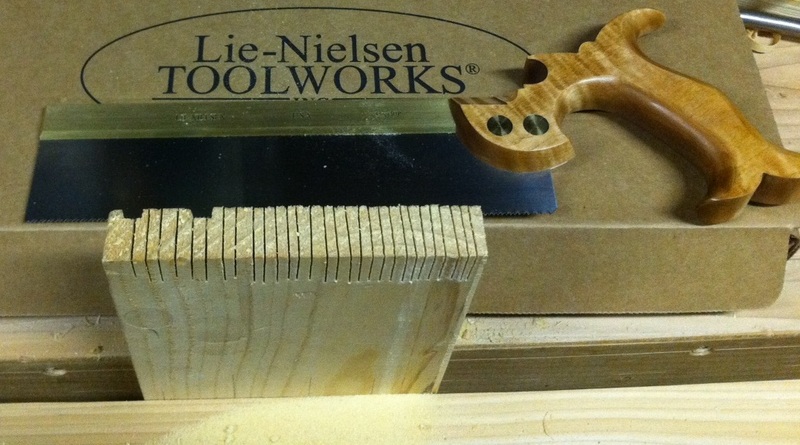 I started this blog with little goal other than to chronicle my aimless pursuit of woodworking. It’s still exactly that, but I do feel like it’s seen its fair share of cool things. I’ve grown my skills substantially, and expanded my knowledge base quite a bit. 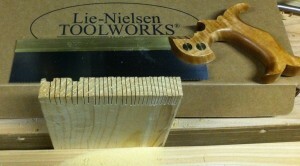 To aid in that quest of Hand Tool zen, my lovely and talented wife got me a Lie-Nielson dovetail saw for Christmas. This is quite possibly the best tool I’ve owned. It’s my first LN tool, and I’m impressed, this is a definite improvement over what I’ve been using. It’s a joy to use, it cuts well and straight and clean. I’m off to the in-laws for some heaping portions of Christmas Ham, but I see some dove tail in my future. I have a board of Poplar that might just turn into a box. I need another box to hold some of my tools since my son absconded with my pinned wooden box for his giant pile of wooden railway train tracks. Oh darn, more shop time.